Lamp or Diya is an indispensable part of worship in Hindu religion. Lamps can be lit using oil or ghee. The correct method is to light Diyas using ghee. 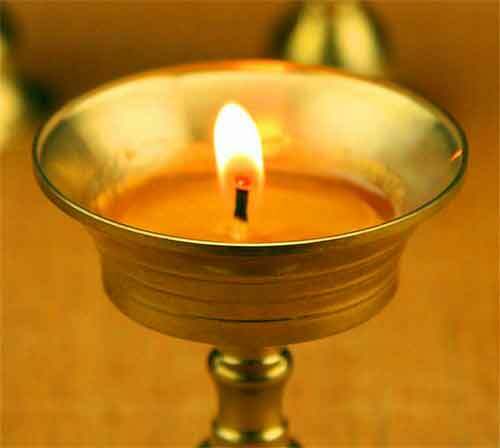 It is believed that lighting lamps for prayer at home using ghee brings peace, happiness and prosperity. Our ancestors insisted on lighting diyas using ghee morning and evening keeping in mind the antibacterial properties of ghee. Such lamps also help in reducing pollution as ghee has the ability to purify air when lighted. It also helped in keeping away small insects. Ghee is also one among the five important items – panchamrit – as per Hindu tradition. Ghee also has the capacity to attract positive vibrations. It is believed that ghee based lamp only spreads Sattwik Guna. The oil based lamp spreads Rajasic Guna more. All the good properties of ghee were when it was not adulterated. So if possible opt for home made ghee.